As no doubt you're well aware, the wonderful world of 70's krautrock is currently experiencing a second lifetime through the CD reissue market, and a number of labels have scrambled to get first dibs on licensing many of these once-lost gems. Unfortunately, the bootlegging of some seminal works early in the game (particularly by the Germanofon folks in Luxembourg... you can identify these by a six-digit catalog number beginning with '9' and otherwise no other markings) undoubtedly hurt the market for future proper reissues. One label that has done it right is Garden of Delights, born in 1992 originally as 'Penner.' Founder Walter N. of Bochum, Germany has painstakingly sought out the master tapes, discovered the present whereabouts of the musicians themselves, collected old photos, wrote up detailed histories, and then managed to work out the licensing to bring these old works to present-day ears. The quality of the output is first-rate, especially considering that the sources are often not ideal. In every case, Walter has arranged for the best available source, and in those situations that only vinyl copies remain, he's paid extra to have them meticulously remastered using the best noise removal techniques. The results are amazing, and hence the listener hears only the music as it was originally performed. The lone downside is that the booklets are so packed with photos, biographies, discographies, etc. that they're too thick to remove easily from the jewel box! In Part Two, I will discuss the lone self-titled studio recording by Tyburn Tall (1972, CD 011), but this time I'll have to start with the CD release of a live reunion concert the band held in their hometown of Speyer, Germany in 1996. An hour-plus sampling of this one-off show was released shortly thereafter as 'Live... and Passion' (CD 021), mostly comprised of cover versions of classic rock songs. With keyboardist Reinhard Magin back on stage providing the rich Hammond Organ sound, TT also ventured into various contemporary and classical works (e.g., those of Mancini, Copeland and Bach). Their own works "In the Hoof of the Cities" and "Prelude" are of course the most worthwhile. Vocalist Klaus Fresenius has a powerful, soulful voice and so while Deep Purple's "Child in Time" is a perfect fit for the band and might have been fun for the audience at the time, it hardly seems necessary to archive this reading for future generations. Likewise for Steve Winwood's "I'm a Man" and "Gimme Some Lovin'," complete with a backing choir of female soul singers. Credible performance, but stick with the original work. Arktis were a mid-70's hard rock group from Bonn that produced three albums that have all been re-issued now on Garden of Delights. 'On the Rocks' (CD 022) was their final full-length release in 1976, though the band continued in various forms until the mid-80's. Though they sported various progressive elements, their songwriting was rather simplistic, more along the lines of Jane, the Scorpions, or especially Phenomena (with Mel and Tom Galley). In fact, though their "Since You've Been Gone" was not the Russ Ballard tune of the same name (made famous by Rainbow), Arktis' songs are not unlike Ballard's power-pop compositions. "Loneliness," at 20 minutes twice as long as it needed to be, is still the album's highlight since I would be inclined to call it 'poor man's Eloy.' The rest of the album has more of an 80's poseur-rock feel, which is interesting as 'On the Rocks' predates them all, i.e. Aldo Nova and the like. However, the playing (especially the drumming) is just too generic for my tastes. Though lead singer Karin Töppig, whose voice is oddly resonant and hardly feminine (sounds like Frank Bornemann, actually), is really quite intriguing as I'm always a sucker for a German accent. One of the rare new recordings to appear on GoD, the quartet from the Black Forest region of Germany named Crabs recorded an album 'Wheel of Fate' (CD 023) in 1994 that failed to find a home anywhere else. Immediately following the studio session, the band splintered apart and so it's with sheer luck that this release happened at all! Good thing - this album is too remarkable to have let pass into obscurity. Crabs had a lot in common with the American neo-psychsters, the ones with a lot of fuzz and some attitude like Helios Creed, Farflung, and especially ST 37 from Texas. The underlying music however, sounds a little more like the Ozric Tentacles covering Ted Nugent's "Stranglehold." I love it! And singer Lea Bayer, she must be the new Renate Knaup... completely fearless. Hardly a beautiful voice, but it's a matter of what you do with it, right? The band's performances are kind of rough and tumble, but when they put it all together (as on "Clean Machine")... Wow! Totally spaced-out, crazed freakazoid psychedelia. Along with S/T, Zone Six and Fantasyy Factoryy, we're now seeing some excellent German psychedelic artists that aren't really tied to the country's own past. Don't miss this one - there won't be another. 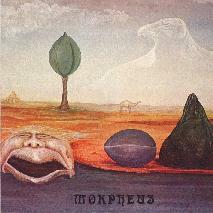 Morpheus were an instrumental psych-prog-jazz rock band (along the lines of early Kraan) that existed for only a short while in the mid-1970's, following a longer stint known as Opossum (whose unreleased recordings may see the light of day on a future GoD release). Their lone LP 'Rabenteuer' (1976, CD 024) is a solid collection of six structured tunes, but the CD adds an excellent twenty-minute bonus jam. The latter is a rougher recording, but constantly evolves through many wondrous phases, including Henrich Holtgreve's effects-laden sax soloing (as if through a wah pedal) and screamin' psych-guitar soloing. The album proper offers a great deal of quirky passages - funky jazz grooves, herky-jerky syncopation, intertwining melodies in 12/8 time, and one excellent spaced-out segment along the lines of Gong's "Inner/Outer Temple." Bassist Peter Blömeke also plays flute on the album, and it works well as the intro to "Abflung" against various spacey sound effects. In total, Morpheus really keep you guessing on this one, and hence I found all of 'Rabenteuer' to be rewarding. This one should have broad appeal. Following their stunning 1973 debut space opera 'Auf der bahn zum Uranus,' Gäa (or Gaia) did begin recording a second work (to be called 'Leico') in 1975, which was never finished before the band finally dissolved in 1978. 'Alraunes Alptraum' (CD 025) takes the three tracks from 1975 (totalling ~20 min.) 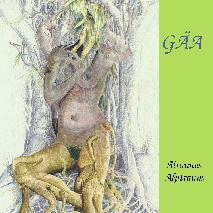 and adds in four tracks recorded by a reunited Gäa (with original member/bassist Peter Bell) in the mid-80's. Unlike the ethereal spaciness of the first album, most tracks feature more of the stompin' heavy organ feel of so many contemporary rock bands. Even so, the 10-minute "Morgendämmerung" is a real winner, separate phases of psychedelia and more fluid jazzy material shining through. The four newer tunes are a hodge-podge of stuff, with a darker, edgier tune in "Du," as well as a cleaner (perhaps too antiseptic) ambient-synth piece and even a cosmic-flavored, but really southern-style, ballad (á la Lynyrd Skynyrd). In all, AA is an interesting collection with some very worthy material, but of course it lacks any sort of continuity. So go out and find 'Uranus' first, it being Gäa's real important work, even though Ohrwaschl did such a poor job in the vinyl-transfer as compared to the fabulous clean-up job done on all these Garden of Delights releases. 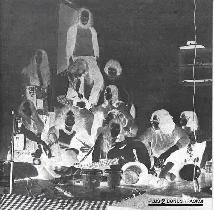 A five-member group from the Heidelberg-Mannheim area, Zyma were a Canterbury-style prog band that made two albums in the late 1970's, 'Thoughts' (1978, CD 026) and 'Brave New World' (1979, upcoming CD release on GoD). 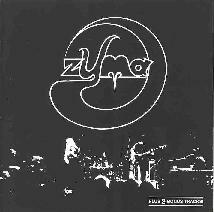 As evidenced by the two CD bonus tracks taken from the Kerston label 'Proton 1' compilation (2LP, 1974), Zyma started out playing a harder-edged progressive style, in some ways similar to Vive la Trance-period Amon Düül II. Both of these cuts would get strong marks from me if the vocal tracks weren't cranked up so high in the mix... really distracting. The 'Thoughts' album itself is cleaner, jazzy music dominated by the Rhodes electric piano sound, along with accompanying flute and violin, i.e., very much like Caravan, Soft Machine, and the like. Zyma featured both female (Dorle Ferber) and male (drummer Udo Kübler) vocalists, and they often sang in duet fashion. The musicianship is excellent, and the songs are very well written. My favorites are the title track and "Wasting Time," where the band sprinkle in some spacier keyboards á la Eloy during the bridge sections. On the other hand there is "We Got Time," the kind of experiment in peculiar time signatures that Egg and Hatfield were famous for. I really like this album, though I'd never have guessed it was made by a German group. The group Try was basically a duo of Berliners, Amadeus Reineck (known for folksy acoustic music) and Michael Lapp (an electronics master who had constructed his own studio). In 1980, they collaborated on a single 40-minute LP entitled "Just a Try" (CD 027), which pretty much summed up their modest intentions. Almost exclusively an instrumental album, they did succeed in producing an interesting collection of ideas that are melodic and cheerful, but not trite (the Tolkien songtitle references notwithstanding). Comparisons to Synergy and Kitaro could easily be made, and while I find that this pristine 'new agey' approach pales greatly in the shadow of the unbridled spirit of earlier krautrock masters, I still really enjoy the uplifting spirit in Try's music. It's no 'Sowiesoso' (Cluster's gem of an electronic album in a 'pretty krautrock' style), but it's still a worthwhile trip to take... a summer holiday soundtrack perhaps? Reineck later went on to release an album of similar style in 1984 under the name 'Suedama,' his first name spelled backwards. Sequentially, the next GoD release was Agitation Free's 'At the Cliffs of River Rhine' (CD 028), but you can read much more about this fabulous piece of work (as well as 'The Other Sides of Agitation Free,' CD 032) in past issues (AI's #6 and 7, respectively). Of course, Agitation Free was one of the most innovative 'kosmische' bands in Germany in the early 70's, sharing its heritage with Ash Ra Tempel, Tangerine Dream, and Guru Guru, among others. The 38-minute 1974 radio concert that makes up 'River Rhine' is already one of my favorite instrumental space-improv albums of all time. The freshness of the music and pristine quality of the recording make it hard to believe it was created 25 years ago. 'The Other Sides...' though was not a true Agitation Free album, and in fact the music (while sharing some similarities in rhythm and form) has a cheerful jazzy quality that contrasts with the original krautrock spirit (i.e., fearless risktaking), and in that way it sounds dated to my ears. A rag-tag group of hippies from Munich, Siloah was fronted by guitarist/vocalist Thom Argauer, who had earlier played in a band with Amon Düül II's Chris Karrer. Their debut eponymous album (1970, CD 029) is 35 minutes of simplistic and amateurish psychedelia, no doubt recorded in a lysergic and/or opiate haze. The style is eastern-flavored psych/folk, and by eastern I really mean Chinese in this case. There really aren't any peculiar instruments used on this album (except a 'shinai' (? ), which I thought was a sword), but the shamanistic rantings and weird pluckings etc. give it a true oriental feel. "Road to Laramy" is the only tune that gets a 'thumbs up' from me, a simple bluesy psych tune on acoustic guitar and bass against wood-block percussion. And I liked the flute soloing in "Aluminum Wind." But the large majority of the album I would characterize by... "Too drunk to play, too stoned to care." The two bonus tracks, rumored to have some members of Amon Düül II guesting, are even less worthwhile, which is probably why these tracks never saw the light of day until now. 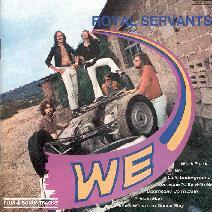 The Royal Servants are one of the oldest GoD bands, founded in 1965 in Reichenbach, but they released only a couple singles and one full-length album 'We' (CD 031) in 1970. However, the band continued on for a few years as Eulenspeygel once they'd switched from English lyrics to German. (Look for future Eulenspeygel releases on GoD.) The Royal Servants were born straight out of the west coast mode... equal parts Steppenwolf, Santana, and the Doors, with perhaps a little Zombies thrown in (the organist Reinhard sounds like Rod Argent, not Ray Manzarek). In any case, purely imported sounds - a microcosm of the FM radio play in any bellbottom-wearing teen's bedroom. Some might still call this 'psychedelic' music, but not me. I don't dislike the music, especially the smooth Latin grooves flavoring a couple of the tracks, but I think they should remain a footnote in German rock history. (I'll reserve judgment on Eulenspeygel until they appear.) The earlier singles, included here as bonus tracks, are less interesting ersatz Beatles tunes. All in all, something for Nuggets lovers only. After their failed first attempt, Siloah's leader Thom Argauer sought out new musicians and assembled an organ/bass/drum trio, eschewing his own guitar in favor of keyboards as some other bands of that era had done. Newcomers Florian Laber (bass) and Markus Krug (drums) added some level of professionalism to the unit, though they still spent only one day in the studio to make 'Sukram Gurk' (1972, CD 033), another obvious 'palindromic' wordplay (on their drummer's name). So instead of what sounded like unfocused ramblings on the first album, here the music has far more definition and is 'rock and roll' at least... the difference between Amon Düül I and II is an appropriate parallel. And while still not exactly a monument to precise timing and technique, the improvisations on 'Sukram Gurk' are really quite commendable. Argauer's vocals leave something to be desired, a little flat and/or strained now and again, and often sounding as if recorded from across the street. But... there is still something poignant about the 'hippy communal spirit' that comes through here... and the playing ability of this combo is just high enough to warrant recommending. Prime drug music, if you will. Note: Buddy Mandler of Os Mundi provided vocals for the six-minute bonus track (this one with guitar, from 1973) "She is on My Mind," necessary to raise the total time of the CD to 40 minutes at least. GoD got off the track a bit for the release of a very obscure 1970 recording by the Munich blues band Pentagon, entitled 'Die Vertreibung der bösen Geister aus dem Pentagon' (CD 034), translated literally as 'The Expulsion of Evil Spirits from Pentagon.' It was actually never issued on LP, only offered on cassette tape as far as anyone knows. The recording is a bit dingy in places, and it hardly embraces the psychedelic spirit of the times, but it's still a decent album in its own right. A number of tracks are 'old style' dance hall R&B fare, even a taste of polka on "Bavarian Theme." But once in a while Pentagon throw in some rock elements to come closer to the Animals or early Jethro Tull. Some of the songs have vocals and Hans-Peter Krohn has a good voice, clearer and less 'ballsy' than your average delta blues singer. Pentagon broke up soon after this recording, but Krohn teamed up with Stephan Micus to record a folk album as 'Krohn + Micus' in 1972, to be yet another GoD release in the near future. 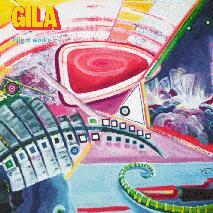 From Stuttgart, Gila is probably the GoD label's second-best known artist (to Agitation Free) in today's krautrock reissue market. And deservedly so... their 1971 debut album (self-titled, but often known as 'Free Electric Sound') is a psychedelic rock masterpiece. The same foursome (fronted by guitarist/vocalist Conny Veit, who later had a stint with Guru Guru) then recorded a concert for radio broadcast on Feb. 26, 1972, subsequently edited down to 43 minutes, and sadly that is all that still exists of this show. Uncovered and released here as 'Night Works' (CD035) though, it really captures a different dimension of the band in a live setting. On tracks like "Braintwist" and the wonderfully cosmic "Gila Symphony," the group comes across much like the Doors doing their own 'Space Ritual.' The Jim Morrison (and even Ray Manzarek) comparisons just have to be made. However, the overall mix of imported sounds still end up sounding very 'German' in the end...for example, the outstanding "Trampelpfad" simply couldn't have been created by an American group. The source tape isn't perfect (a few noticeable dropouts now and again) but the magnificence of this single performance is still preserved. And all of the tracks are unique to 'Night Works,' making it a true second album by the original lineup. A third album by a revamped Gila ('Bury My Heart at Wounded Knee') is to be an upcoming GoD release. 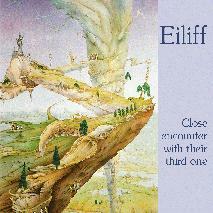 Following their two studio albums, Cologne-based Eiliff recorded a live concert for the WDR radio program 'Nachtmusik' in late 1972. Previously unreleased, GoD has now cleaned up the tapes and issued the show on CD as 'Close Encounter with their Third One' (CD 036). 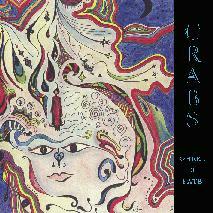 The crazy five-minute experimental piece "Lilybaeum" opens the album, but the bulk of the show is rompin' stompin' free-for-all psychedelia, along the lines of Guru Guru. Of course, guitarist Houschäng Nejadépour (a German, but of Iranian heritage) later went on to play with Mani Neumeier on the excellent 'Dance of the Flames' (1974) album. Amidst the extended guitar soloing, there's plenty of Rainer Bruninghaus' 'dirty' organ sounds and Herbert Kalveram's high alto (or even soprano?) sax playing. The lone weak spots within the 47-minute show are a useless four-minute drum solo (aren't they all?) and the lone attempt at vocals during "Hallimasch," rather more like (badly) spoken poetry. However, the very next minute Eiliff starts jamming again in top fashion, so it's forgivable. This is true 'krautrock,' in its most wildly adventurous state. This brings us up to the present, but certainly many more excellent works remain to be rediscovered. If you're like me, the double dose of excellent new recordings and reissued gems of the past in the marketplace has caused a serious drain on your personal finances, so I don't expect that many folks searching for new discoveries will have the resources to take too many guesses. Or simply buy everything that has potential. So in summary, I'll do something a little presumptuous and tell you precisely what you should (and shouldn't) snap up from the recent Garden of Delights catalog, given that the tastes of any given AI reader should at least overlap with my own in the realm of space & psychedelia. Of course, your mileage may vary (as they say), and so I urge you to first consult the review paragraph for each item before you buy. In the next issue, I'll look back to the first twenty releases on Garden of Delights and then also talk about the four compilation CDs on the spinoff 'Psychedelic Gems' label.